I 'he male of this species is a remarkable bird with a pale body, deep black head and nape, a vivid blue eye-ring and bill, and a startling tail that culminates in two extra long feathers known as streamers. These arc-used principally for display to the female in courtship behavior. 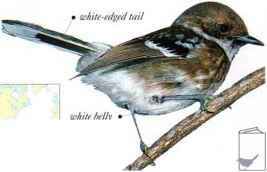 When perched, the male often Hicks his tail feathers, opening and closing them in a quick, scissorlike movement. I lis white plumage takes at least four years to develop, immature males resembling females. Birds Iced by catching insects in short, aerial chases. They bathe by flying down to water and splashing at the surface, before returning to a perch to tidy and clean their plumage. The call is a short, grating note. • DISTRIBUTION Breeds in Indian subcontinent, C. Asia, parts of China, and Korea. Northern populations winter as far south as S. India, Sri Lanka, and parts of E. Indonesia. 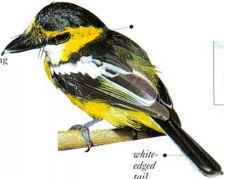 This forest bird feeds on insects, which it gleans from the foliage or catches in aerial sallies from a perch. Often seen perching with tail cocked up, it is bold and inquisitive. • NEST A small cup nest made of tree fern scales and lichens, bound together with spiderwebs, and placed in a shrub or low tree. 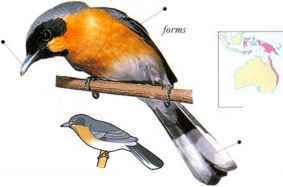 I his rain forest bird has variously colored underparts, from all white to all orange, in the different parts of its range. It favors the lower levels of the vegetation where it gleans insects and spiders. • NliST a Clip nest made of plant fibers, leaf skeletons, and bark, decorated with moss, and placed in a tree fork. 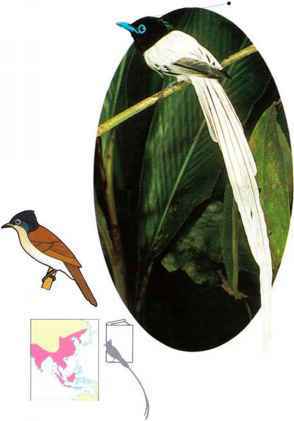 New Guinea, and N.E. and E. Australia.